A man who filmed his girlfriend’s dog performing “Nazi salutes” and posted the footage on YouTube has been convicted of a hate crime. 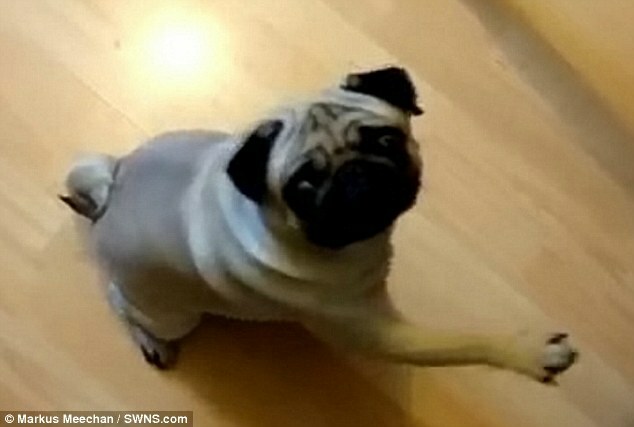 Mark Meechan, 30, recorded the pug, Buddha, responding to statements including “gas the Jews” and “Sieg Heil” by raising its paw. He was arrested following complaints about the video, which was viewed more than three million times after it was uploaded two years ago. Meechan, of Coatbridge, Lanarkshire, denied any wrongdoing and claimed he made the video to annoy his 29-year-old girlfriend Suzanne Kelly. However, Sheriff Derek O’Carroll found him guilty at Airdrie Sheriff Court of a charge under the Communications Act of posting a video that was “anti-Semitic and racist in nature”. He said he believed Meechan left the video online to drive traffic to other material he had posted, adding: “In my view, it is a reasonable conclusion that the video is grossly offensive. The description of the video as humorous is no magic wand. “This court has taken the freedom of expression into consideration, but the right to freedom of expression also comes with responsibility. Ross Brown, defending, claimed his client’s purpose was to annoy his girlfriend, who testified that it was an example of his sense of humour. In the video, the dog is seen appearing to lift its paw to the “Sieg Heil” command. It is also filmed watching a rally led by Hitler at the 1936 Olympic Games. Outside court Meechan said he planned to appeal, adding: “I think it is a very dark day in regards to freedom of speech and freedom of expression. He will be sentenced next month.